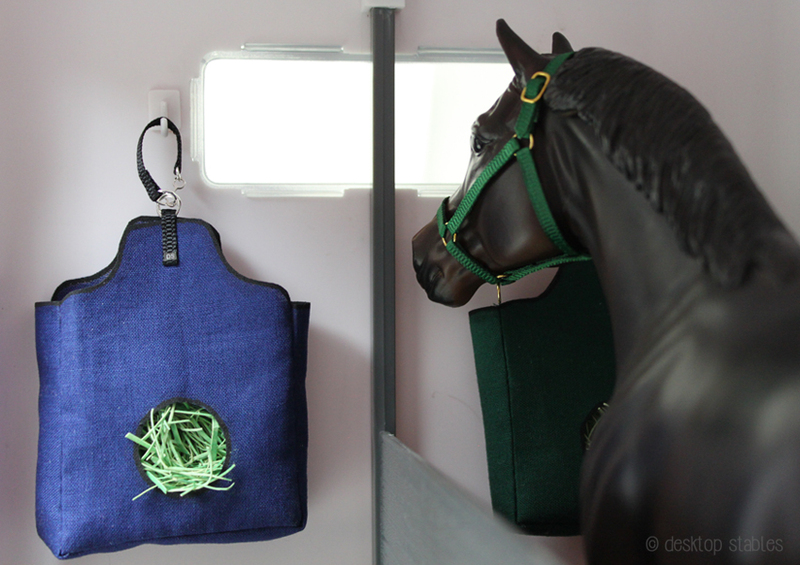 It’s been another saddle pad and halter sort of week. 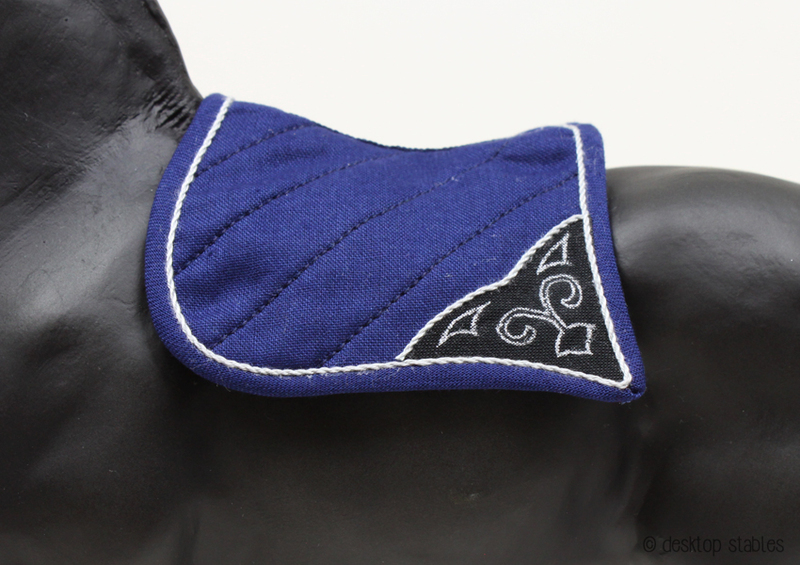 The herd has also grown… uh, a bit, (some were tag-alongs) and several of them needed special saddle pads, because I guess that’s a thing now in addition to halters and blankets. First, this navy swallowtail styled one. 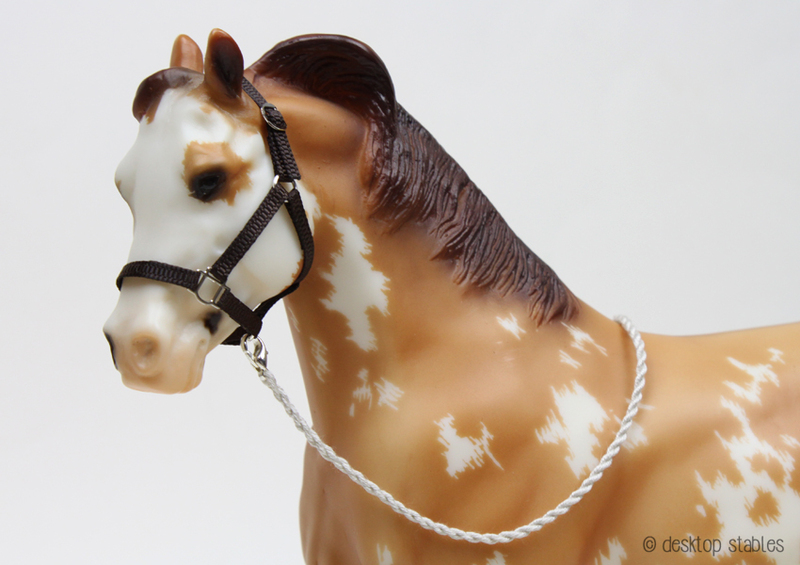 This is a mini version of full-sized ones sold through the Baroque Horse Store. 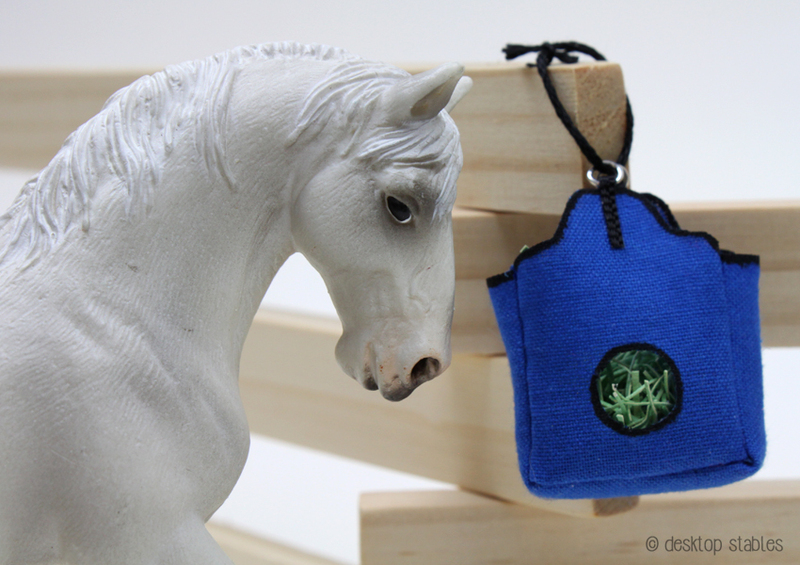 Lately I’ve been really attracted to Baroque/Medieval-ish/Fantasy inspired tack, so I’m sure more inspired pieces will follow sometime down the road. 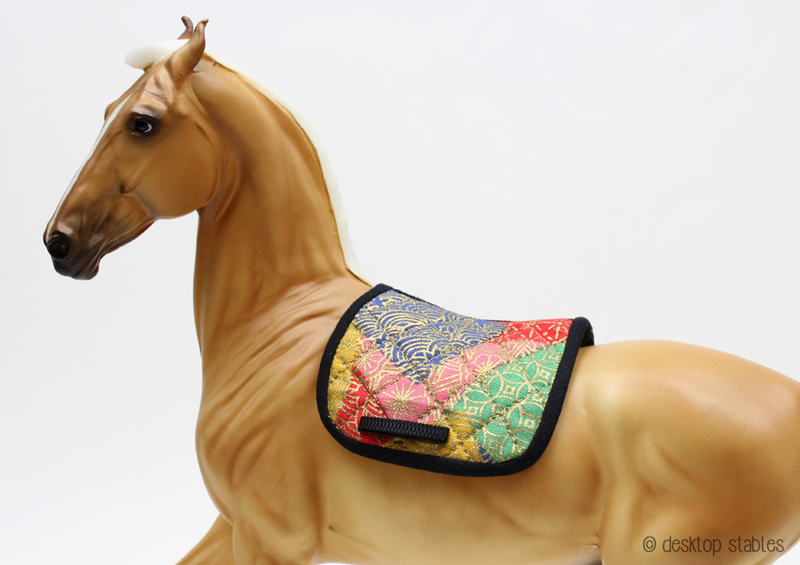 I remember reading somewhere that the swallowtail styled pads used to be really popular but went out of fashion in the real horse world? 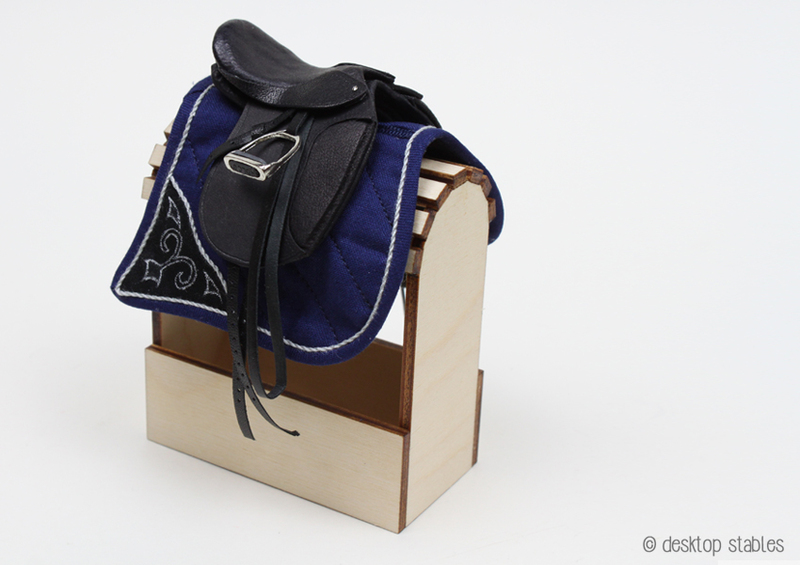 By the way, the saddle stand was made (and gifted to me <3) by Bobbie of Horse Tender Studio. 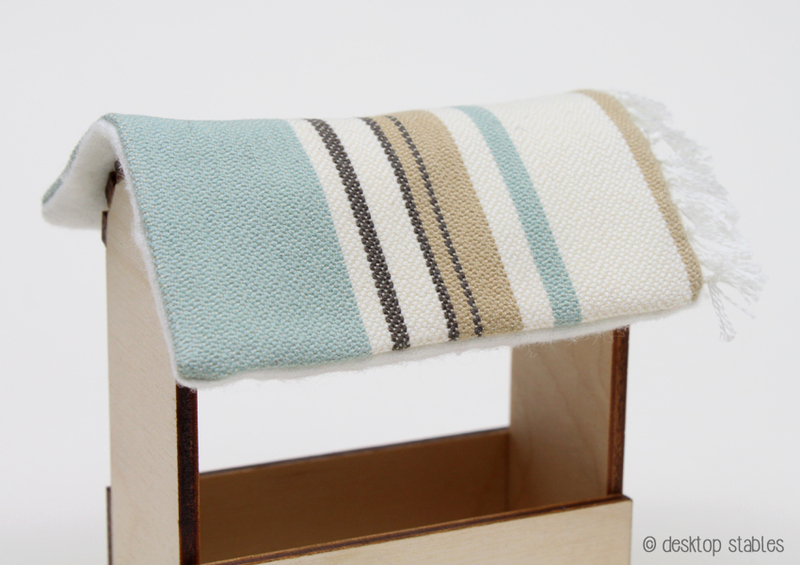 These stands are super nice and of great quality – check them out! Bobbie also gifted me this fabric, and I couldn’t wait to put it to use. I decided to quilt it with metallic gold thread, which was a huge headache but I like the end result. 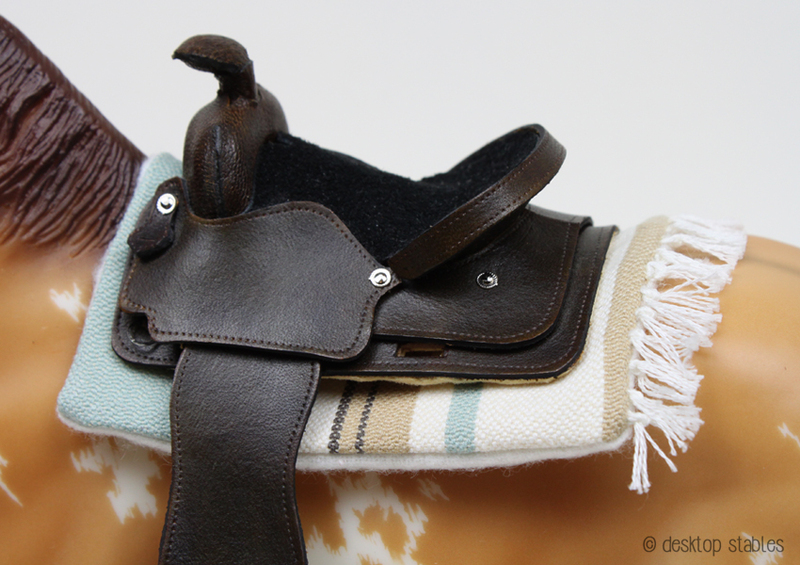 And lastly, a western pad was made from a fabric sample I’ve had in a box forever. It was just big enough! The fringe on the bottom was an experiment that seemed to turn out ok.
It’s kind of strange not making a contoured pad though, haha. 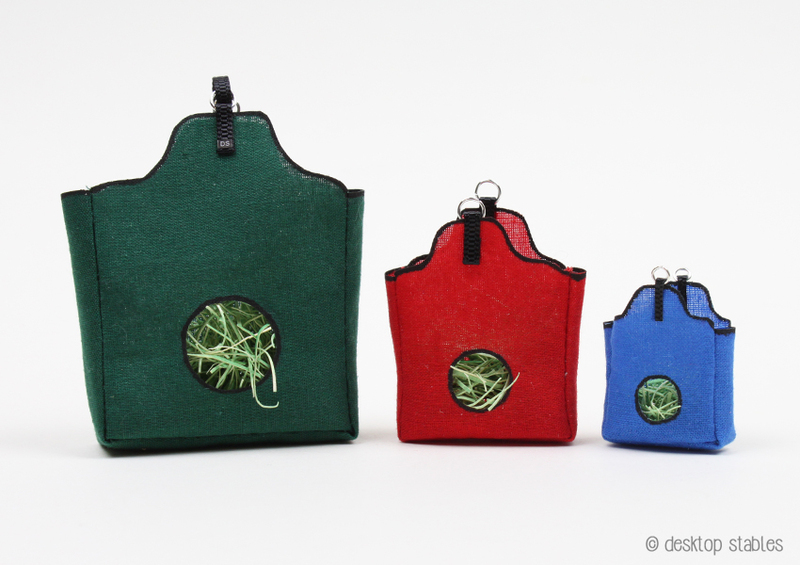 Recently I was inspired to make hay bags for my models, and have turned it into a tutorial for you all. The Pattern – can’t open a PDF? Download this – it’s free! The first step is to iron your fabric to remove all wrinkles. 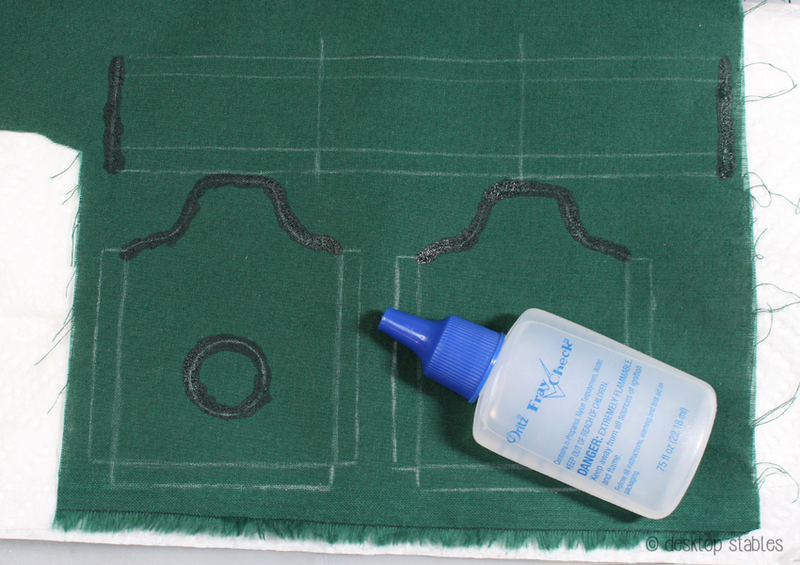 Cut out your pattern and trace it onto the wrong side of your fabric. 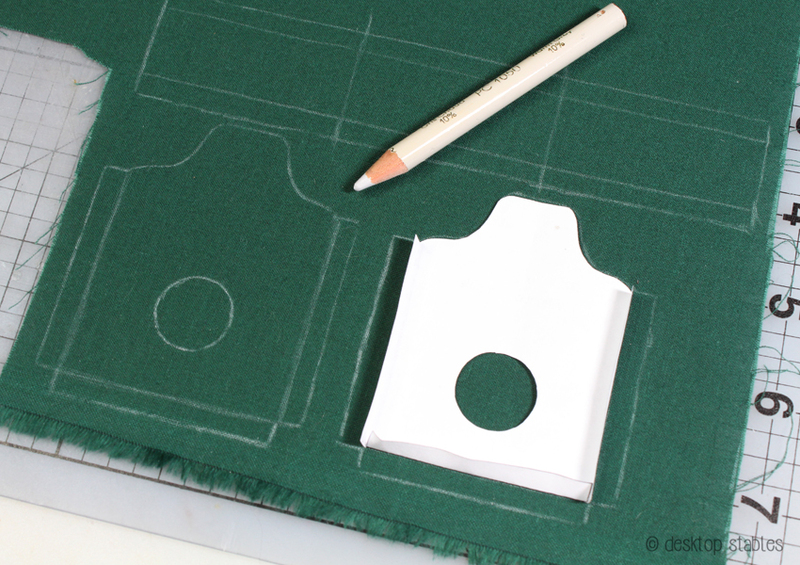 The pattern includes a seam allowance – you can add this in free hand or bend back the pattern tabs, then trace again. 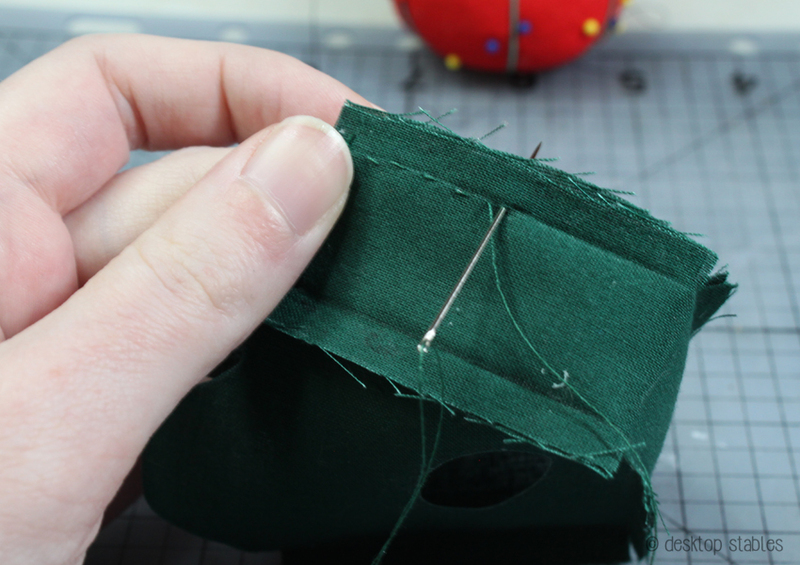 With Fray Check, go over the lines of the round opening, top edges of the bag and short edges of the long piece, then let dry completely. This will soak through the fabric so make sure you have something underneath! 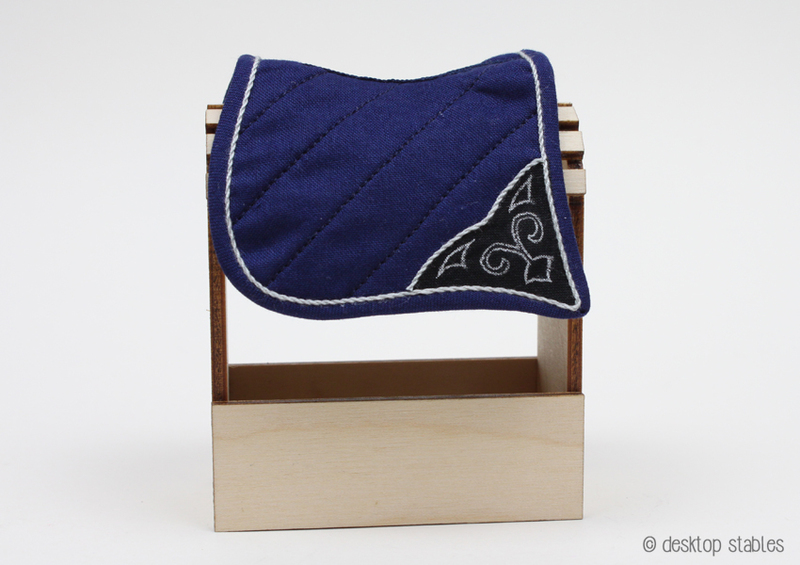 Fray Check can darken some fabrics, so it would be a good idea to test a scrap piece first. 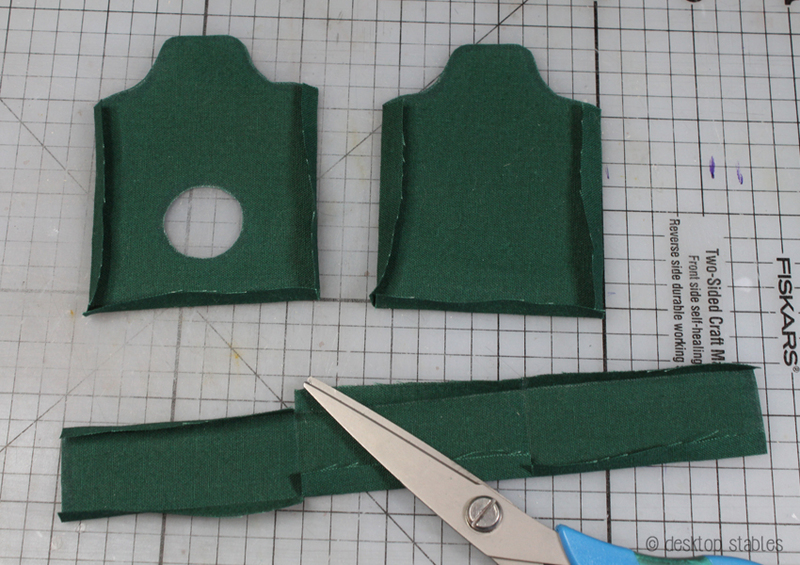 Cut out your pieces, then fold all tabs inward and iron down. 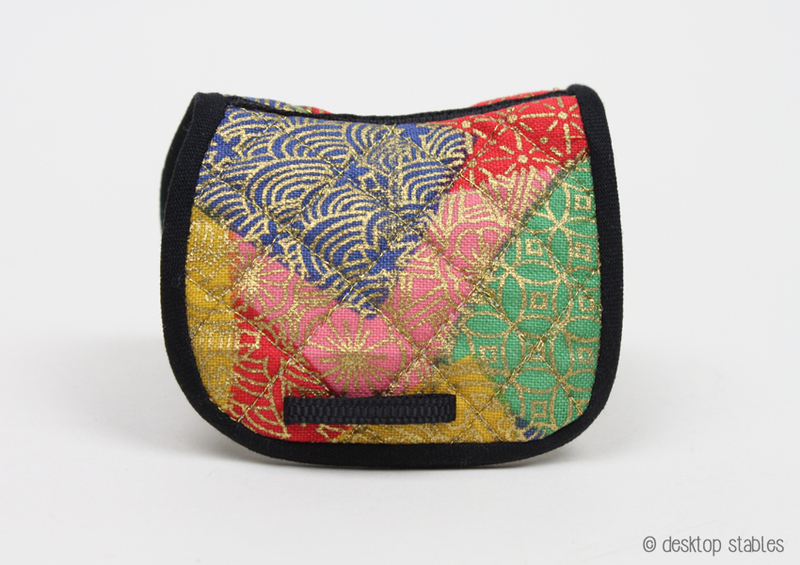 The long piece’s pattern is divided into three sections. 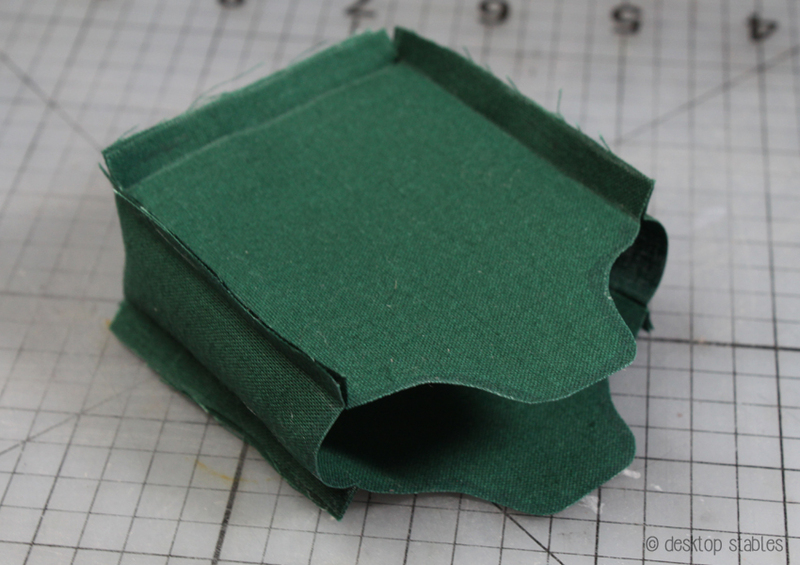 (marked with dotted lines) Fold and iron these down, then make small cuts in the tab on each side. 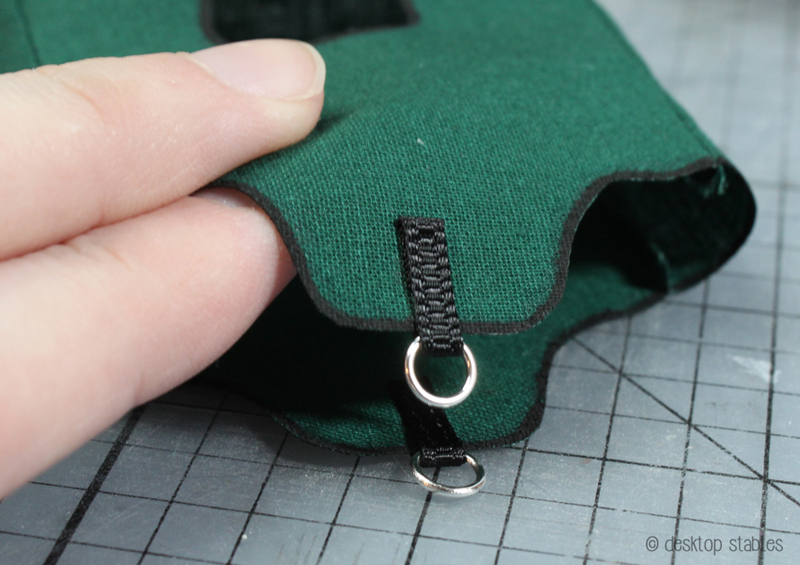 Line up the top edge of the long piece with the edge of a bag piece, then glue the tabs together. I’m not using a lot of glue here – just enough to hold it in place. Repeat with the opposite side, then glue the middle section together. Repeat with the second bag piece. 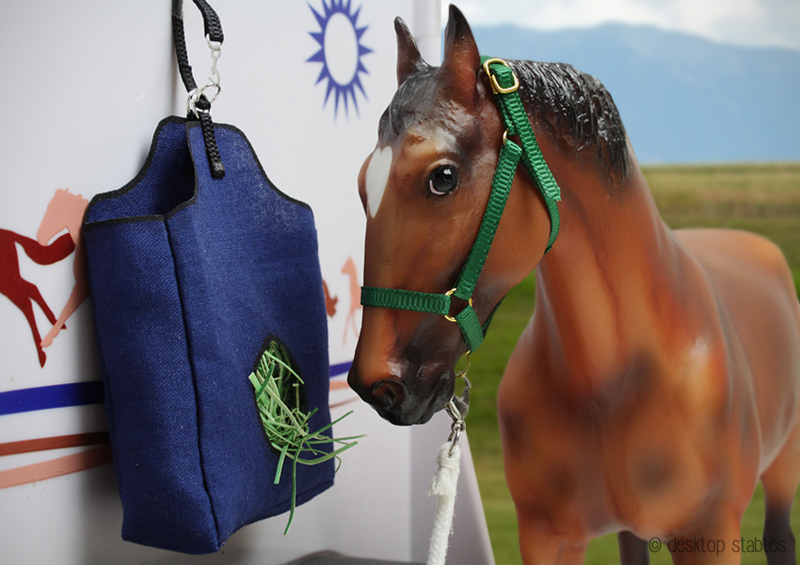 You should have an inside out hay bag when you’re finished. 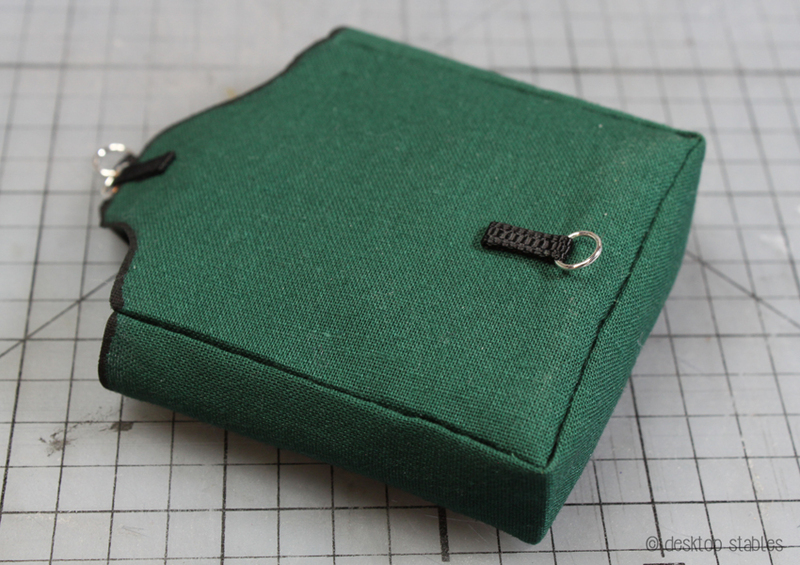 Sew the bag together along the folds. 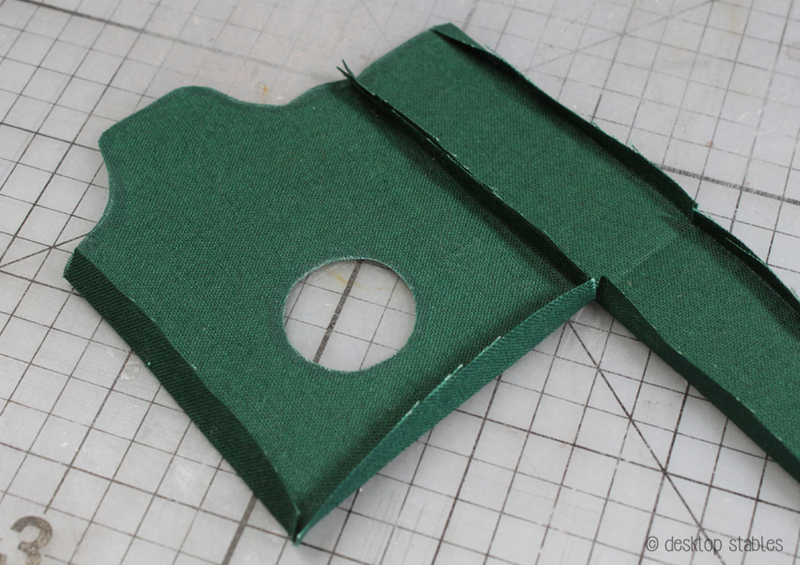 You could skip this step altogether (depending on how much glue you used) but I want a little more strength here. 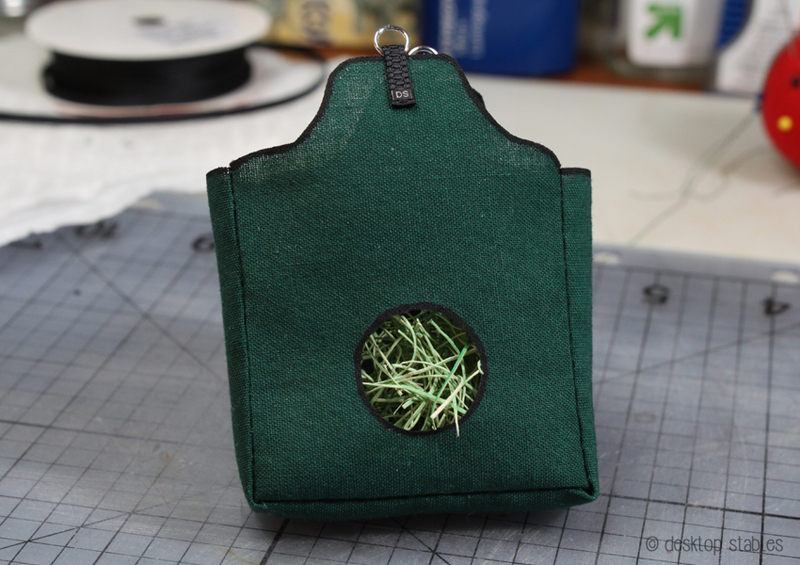 Trim off the excess, then flip the bag right side out. Press the edges with an iron (or your fingers!) to shape it. 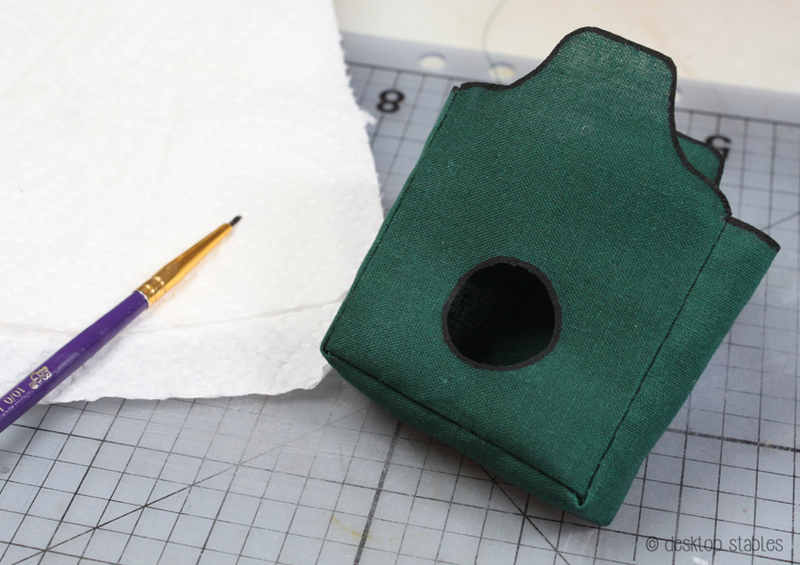 Add paint around the top edges and opening for faux binding. Remember to paint the inside edges too! 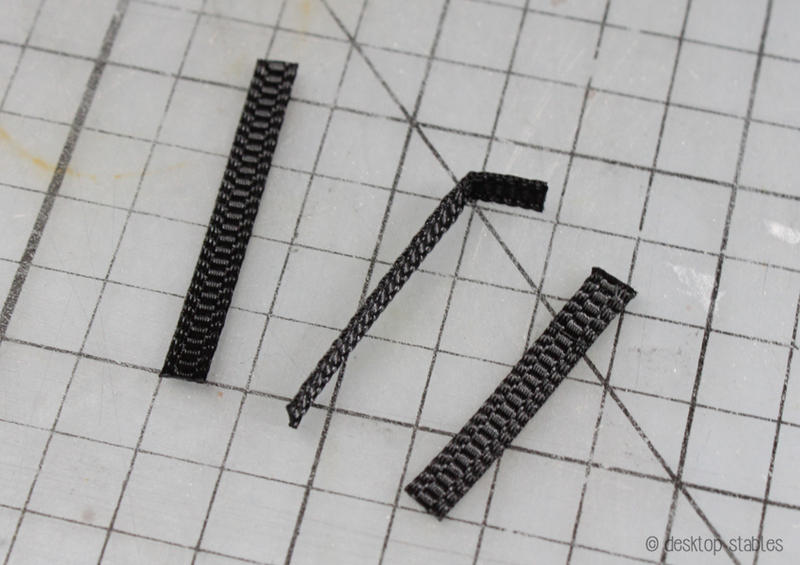 Cut three pieces of ribbon about an inch long. 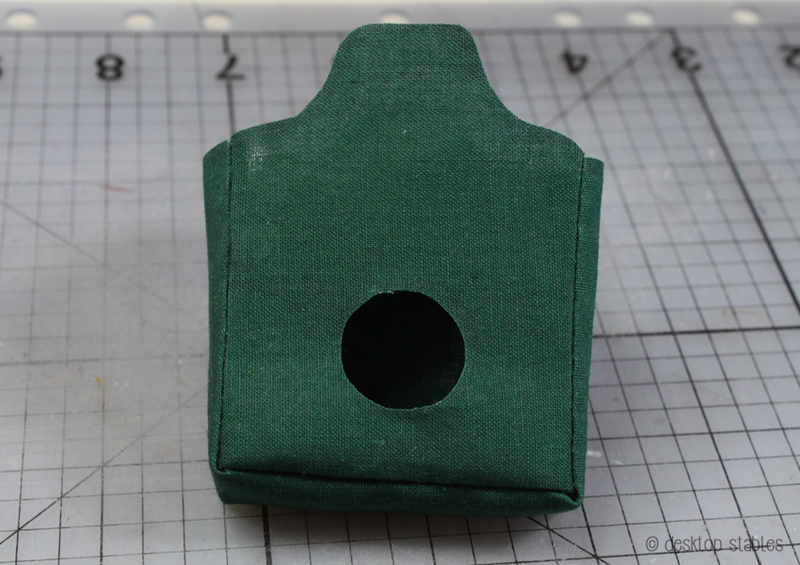 On two of the pieces, fold a small amount over and glue down. 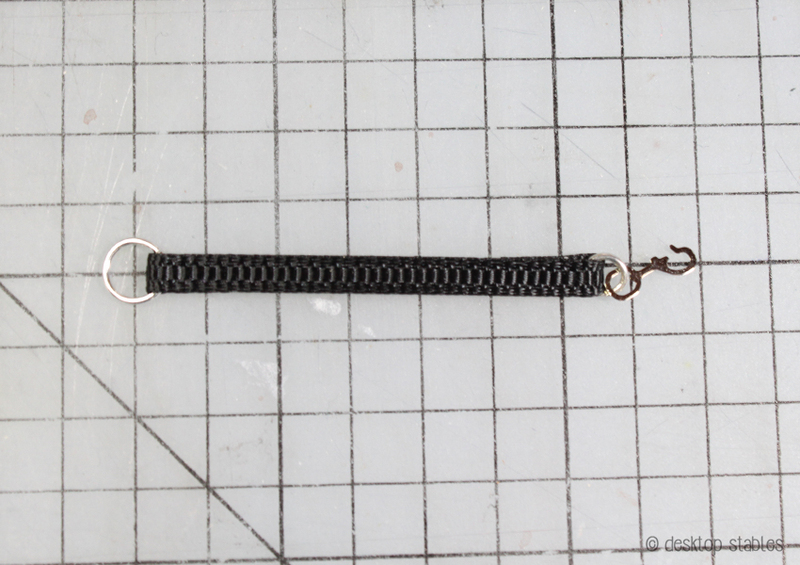 Fold these in half and thread on a jump ring. 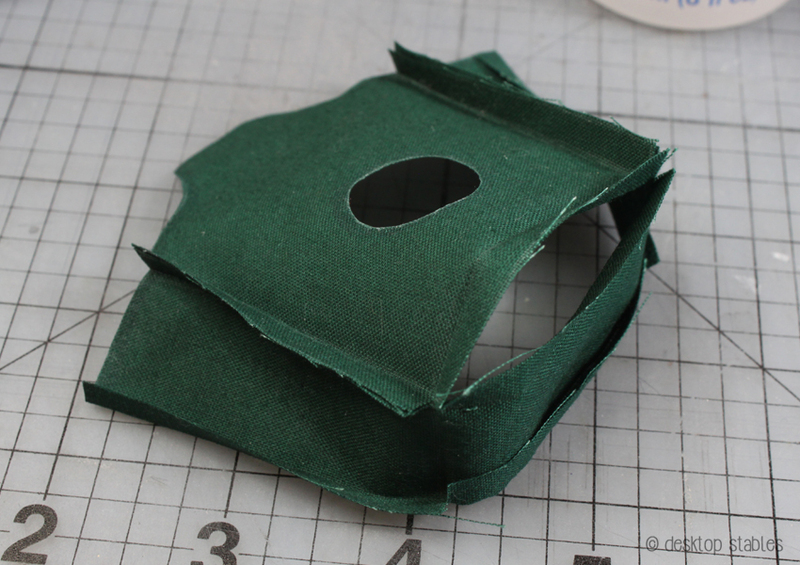 With the folded side on the outside of the bag, glue over the top edge. The smaller ones are made the same way. 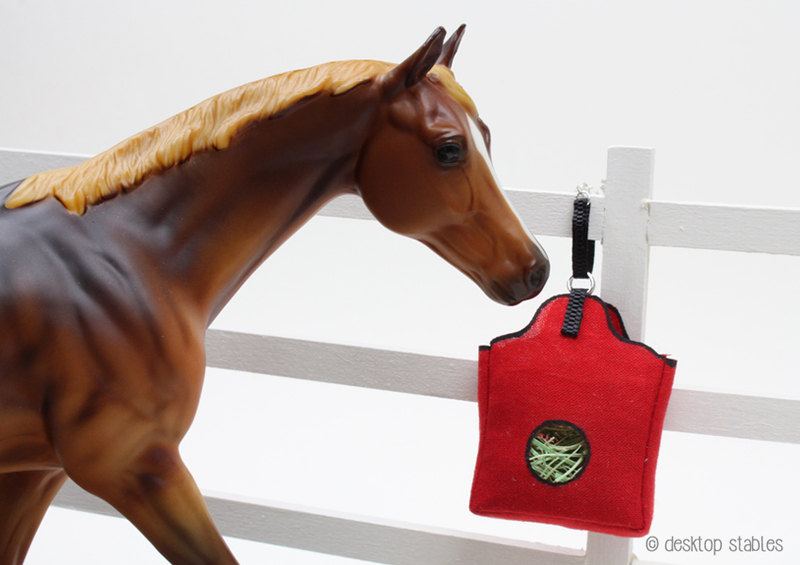 For the Schleich size, I saturated a piece of 1/8 ribbon in Fray Check, then split it in half to get a thinner piece.